The Blogger’s Guide to Irresistible Ebooks was fully updated, with new material and video bonuses, in December 2017. Is writing an ebook a great path to fame and fortune … or an easy way to waste months of your life? 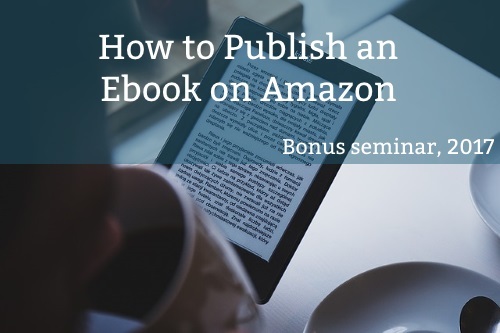 Let me teach you exactly how to create ebooks that your readers will snap up. You’ve probably read a few ebooks – or maybe a few dozen. You know that a free ebook would win you more subscribers, and that a paid ebook could be a great source of passive income. The problem is, writing an ebook isn’t like writing a blog post. Ebooks require time, dedication and careful planning and design. Note to novelists: The Blogger’s Guide to Irresistible Ebooks is aimed at non-fiction authors, but a fair bit of the advice applies equally to fiction books (e.g. on staying motivated, uploading your ebook to Amazon, etc). If you write novels (or other fiction), you’re very welcome to buy Irresistible Ebooks, try it out for up to 12 months, then return it for a full refund if you feel it wasn’t a good enough fit for you. As well as publishing my own ebooks – some free, some paid-for – I’ve helped a lot of writers (clients and friends) get their own ebooks out there into the world. I know that writing and publishing an ebook can feel very daunting, so The Blogger’s Guide to Irresistible Ebooks is designed to give you everything you need to know in easy, short chapters. I’ll take you through everything from writing the content to creating the sales page. In just a month’s time, you could have a finished ebook for sale. The Blogger’s Guide to Irresistible Ebooks is a 125-page ebook, packed with tips, ideas, examples and screenshots to help you create a hugely successful ebook. I updated it extensively in December 2017, adding new material on selling through e-retailers’ stores (particularly Amazon) as well as on your own website, and adding bonus videos. The Blogger’s Guide to Irresistible Ebooks is $25, which includes all future updates and additions. I knew a lot about getting your ebooks out there but very little about the basics. I’ve been learning by trial and error which has led to lacklustre sales. […] I believe that this product fills a much-needed gap in the industry and should be the first book people buy when creating their first product. 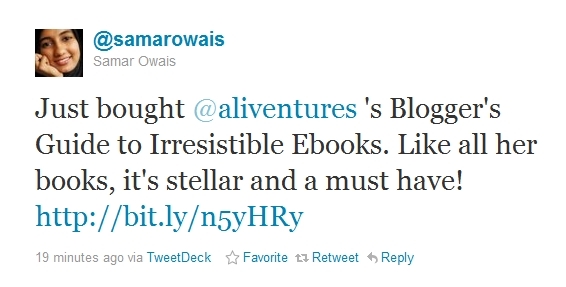 I loved Irresistible Ebooks. It’s so concise, yet so comprehensive! 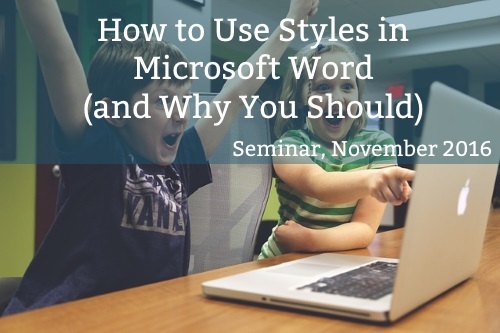 Everything you need to know is right there, from overall strategy to how-to details. I’ve read a ton of stuff on this topic, and I still picked up a few things I didn’t know. Great job! Chapter One: What Type of Ebook Would Work Best for You? Chapter Seventeen: Different Ebook File Formats – Which Should You Use? As soon as you’ve bought the Guide, you’ll get full access to these videos, plus audio versions and full, edited transcripts to make it as easy as possible for you to successfully publish your own ebook. Ali, I like how you’ve laid this out. This is the first time that I’ve seen a true writer lay this out, versus the typical ebook author that says, “Just bang it out, release the book, market it, and watch the money roll in.” What you’re providing is fresh, in my opinion. 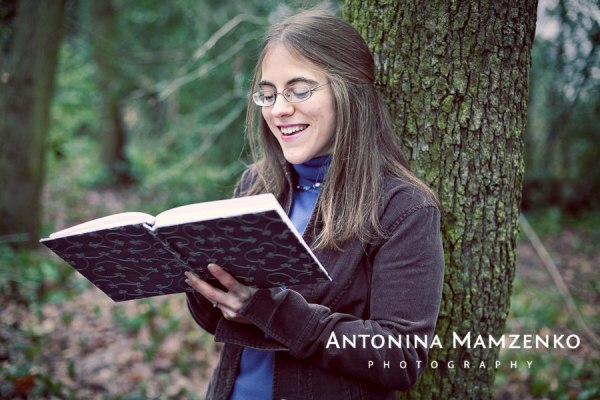 Successfully writing and launching an eBook can be a daunting task. 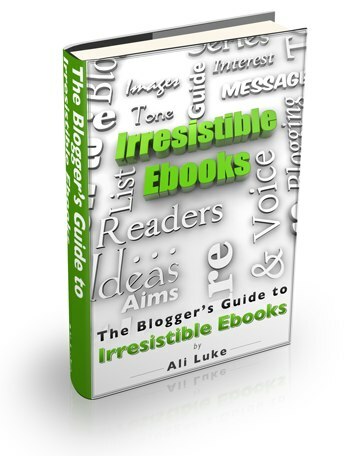 But, Ali’s The Blogger’s Guide to Irresistible eBooks seems to literally take you by the hand and walk you through the entire process! As you’d expect, the work is well organized. What I appreciate most are the examples and the links to quality products which can aid in saving time and getting to the finish line more quickly. Something I am continually working on in my writing is creating a warm and engaging “voice”. I feel like Ali is actually sitting there talking me through some of the more technical aspects, like setting up a sales page or e-Junkie links. All in all, if you have an eBook within you, yet to be birthed, TBG to Irresistible eBooks is a must-have. I’ve taken advantage of personal coaching as well. I know I have the tools I need to get the job done. 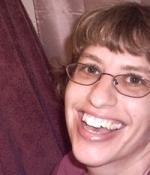 I hope that your ebooks will be as successful (and as fun to write!) as mine have been. If you’re not happy with this ebook for any reason, just let me know within twelve months. I’ll be very happy to refund your money. Why such a long guarantee period, when 30 days is standard? Because I want you to have the time to really put this into practice and see the results for yourself. At first, I was sceptical. 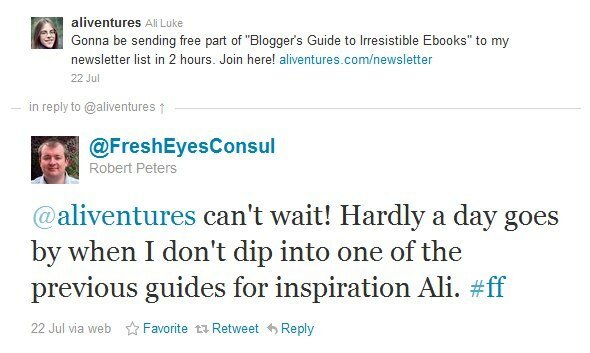 I’d read Ali’s blog, caught up with her guest posts…heck, I’d even been a student on her “Blog On” course. She’d given me so much help, so much useful content, I didn’t think there was much her eBook could add. After all, I’d written my own eBook, hadn’t I? The Blogger’s Guide to Irresistible Ebooks is essential for anyone who wants to develop the type of eBook people actually read . All too often, eBooks are over-written and under-read. They end up in the hard drive equivalent of the Falkland Islands, gathering dust. Unless you learn how to conceive, write, format and market an eBook like an expert. Unless you had a handy tome to read before, during and after writing your eBook. A tome which contains all the advice you need…and not a letter more. Unless (and you can probably tell where I’m going with this) you have The Blogger’s Guide to Irresistible Ebooks. Sure, other books are out there; some have as much helpful information, some are as well written and some are the same bargain price. But I bet you can’t find another which meets all 3 of those criteria.